Last Sunday I went for a recreational bike ride for the first time since the summer, I think. I ride almost daily as transportation but somehow there has been no riding just for fun. Which just goes to show I’m not living my life right. It wasn’t a long ride, but just wandering around with no special destination or schedule to keep was a balm to my parched cyclist’s spirit. I decided to take a short ride down to check out the new Walterdale bridge, recently opened after running two years behind schedule in construction. On the way there I passed another sort of bridge: the temporary track being constructed for the Crashed Ice downhill skating race happening in a couple of weeks. Just a bit farther down the hill in speed to admire a mighty heap of snow. When the snow is cleared from one place it has to end up somewhere else, in this case piled up nearly to the height of a nearby bird’s nest. On the way to the new bridge I paused for a moment under one of the older ones. This is a very functional, non-decorative sort of structure but there is a pleasantly cavernous or cathedral-like atmosphere in the space beneath it with striking, if severe, linear character. The new Walterdale bridge is meant to be a signature feature of the city, and I do think they came pretty close to the mark. The curving East side pedestrian walkway isn’t open yet, so I had to make do with the less interesting west side path but I was suitably impressed with the impressively arched structure. Of course I’ve seen it from a distance but traveling across it is a different matter. The river below hasn’t quite opened up yet but the thaw can’t be far off now. In the distance you can see another signature Edmonton landmark ,the century old High Level Bridge. It is an open question what the future of that bridge is, as a recent engineering study reports that many of the components of the bridge have corroded to less than half of their original thickness. The bridge is still usable because it only carries automobile traffic now rather than also supporting loaded freight trains but any eventual major repairs would be very expensive. On the way home I took the opportunity to ride a little bit of the river valley singletrack, and enjoyed the very good trail conditions and a riding surface well packed down by swarms of fatbikers. Instead of riding back up out of the valley I took a trip up the newly opened funicular just because I could. One last point of interest before heading home was this sign featuring some very sinister looking icicles. My current home of Edmonton isn’t very windy by the standards of the place I grew up. When the people here get worked up about how strong the winds are during a storm, I’m most often underwhelmed. Are trains blowing off the tracks? Are truckers driving down the highway two-abreast to try to stay on the road? No? It’s not that windy, then. Go to Wreckhouse during a Southeaster and then we can talk about wind. On other hand, we do get intense winds here in Edmonton during summer thunderstorms but they usually only last for less than half an hour. When a breeze settles in to stay a while it is quite the occasion. And then there are tornados on the prairies as well – something I hope to never see. Given all that, our recent day-long storm with gusts exceeding 100 km/h was a pretty big deal here. I rode to work in the morning on my Raleigh Superbe through a steady downpour and with a strong tailwind. The storm kindly expended most of its force while I was snug inside at work listening to radio reports of the storm damage, power outages and fallen trees. By the time I was heading home there was only a stiff headwind with driving rain that fizzled out as I rode. The were were certainly a lot of branches and twigs stem across the asphalt. I decided it was probably safe to dip down onto the Mill Creek paved trail for a short distance and see if there was any storm damage. In what was likely less than a kilometer of riding I had to get past about eight trees fallen across the path. I forgot to count at the time. I didn’t take any pictures due to the rain, but the next day on my way to work I took one shot before detouring back to street level. The city announced that all River Valley trails we closed for the day, but the foresters put in a hard day’s work and almost all the paths were reopened by time time I was headed home. All in all, I do have to admit that it was a fine little breeze we had. Challenge complete! It was warmer this week, most of the early snowfall has now melted and the normal autumn weather felt like a reprieve from a winter that hasn’t officially arrived yet. I found the time to get my third three-speed bike into service to ride for the challenge and met my additional personal goal of riding each bike at least three times during the three weeks. The last of my bikes to be used in the challenge is the first three-speed I ever owned. I bought this 1965 CCM Continental a few years back from the Raving Bike Fiend. It’s a lovely old bike that has only seen light use since I acquired it. Unlike the Superbe or the R20, and for reasons I can’t quite pin down, this one insists on being ridden at a leisurely pace. I’ve mostly used it for relaxed family rides or as a show bike for group rides.I rode it for the 2011 Edmonton Tweed Ride. I dressed it up a bit for the first 2012 Edmonton Steampunk Bike Ride. On the more practical side, I rode it to work one frigid winter morning when it was so cold that the freehub on my winter bike was freezing up – no need to worry about that with the Sturmey-Archer three-speed. The bike has front and rear lights intended to powered by the dynamo built into the AWG rear hub but I’ve never got around to wiring them up properly. It has steel rims, a one piece crank, fantastic high bars and weighs about 40 pounds. The bike is a bit small for me and as nice as it is to have some Made in Canada content in my little bike fleet, I think I will soon sell this one. I hadn’t ridden it in all of 2016 and I don’t believe I rode it more than once in 2015. With this October Challenge I was glad to have a reason to shuffle it out from the back of the bike pile in my garage, dust it off and ride it for a few days. On Sunday and Monday I played it safe and commuted on my winter bike but by Tuesday the conditions seemed suitable for bringing out a three-speed again for the 20km round trip to work. Road construction caused me to detour onto a short segment of footpath. On the way home I stopped to take a few pics of the rapid progress that’s been made on the new footbridge that’s part of the city’s funicular project. Given the foul weather on the previous Friday I had been cranky about the lengthy detour this bridge construction forced me to take. However, now that the hill is open again and I can see how much work they got done over the course of four days I have to be impressed with the good job the workers seem to be doing. That evening I also completed a second qualifying ride when I rode my Raleigh 20 on a 5.5 km round trip to Kingsway mall to run an errand. I didn’t stop to take any pictures but I did notice just how much more nimble and zippy the R20 is compared to the CCM. I managed to get one more qualifying ride in on the CCM with a 8km roundtrip downtown to visit the bank, shop for supplies at the downtown farmers’ market, and drop in at Bikeworks North on the way home. I couldn’t let the entire October Challenge pass without getting tweeded up at least once so I dug out my Harris Tweed for this ride. It was a wonderfully relaxing afternoon ride under a bright blue sky while breathing in the crisp autumn air. While downtown I snapped a few pics of the recently completed Kelly Ramsey Tower. The original building was badly damaged by a fire in 2009 and was eventually demolished. However, much of the original facade was salvaged and reassembled as part of the new building. I often feel ambivalent about projects that preserve the only exterior of a building but in this case it was well done to save something from the aftermath of the fire. After popping in to Bikeworks to say hi to the other volunteers I rolled across the avenue to the Hungarian deli to buy a couple of links of their medium-hot sausage. This little unassuming shop has lots of interesting products and is also my source for jars of thick, tangy rosehip jam. That was my final ride for the October Challenge – it was lots of fun to get out and ride these pleasing and practical bikes. During the challenge I rode my Raleigh Superbe seven times with six qualifying rides totaling 106 km (66 miles). I rode my Raleigh 20 four times with three qualifying rides totaling 30.5 km (19 miles). I rode my CCM Continental on three qualifying rides totaling 48 km (30 miles). Of all the rides only one was strictly a pleasure ride – the others all qualified as utility rides. Thanks to Portland’s Shawn Granton of Urban Adventure League & Society of Three Speeds for creating the challenge. In this second week of the Three Speed October Challenge I completed the minimum criteria of three rides of at least three miles. A pair of autumn snowstorms and other logistical problems limited the number of three speed rides and frustratingly prevented me from bringing my third bike into play again. Next week. . . The snowfall that began on Saturday continued through the night and into Sunday morning. I lingered about the house once again before heading outside. I wheeled my trusty grocery-getting Raleigh 20 Three-speed out of the garage and through the garden, ducking under branches sagging under the weight of the heavy, wet snow. This ride turned out NOT to be qualifying ride as it was less than the required distance but I include it anyway in the interest of promoting the practicality of three-speeds. The snow was already starting to melt on the streets so the trip to the grocery store was a sloppy, slushy ride but the fenders did their job. Once I was finished shopping I loaded up the R20 with the goods. The small wheels and low center of gravity makes this bike practical little cargo carrier. That old two-stay pletscher rack has been often loaded up with far heavier loads than I suspect it was ever meant for – in this case 40 pounds of kitty litter plus two panniers of food. Later in the day, I brought out the Raleigh Superbe for a qualifying ride of about 16km, heading down to Whyte Ave for a burger, beer and socializing at the Next Act Pub. By that time, the roads were clear of snow and the temperature had risen to merely bracing. I traveled by way of the Legislature grounds and across the high level bridge. While on the High Level I stopped to take a pic of the new bridge being constructed to replace to old Walterdale Bridge. It’s well behind schedule, but is going to be quite impressive when finally finished – in the pic one can see both the smaller old green bridge and the swooping arches of the new one. Monday was Thanksgiving, and my only ride was to pop out on the R20 to The Italian Center Shop to pick up some feast ingredients. This locally owned neighbourhood grocery store has everyday staples as well as lots of interesting imports and is one of my regular stops. It also has a nifty mosaic outside. This trip is usually about a three mile ride exactly, but in this case I forgot my lock and had to double back for it putting it easily over the qualifying distance. This day’s ride was another 20km round-trip commute on the Superbe. At -6°C it was another brisk morning, but beautiful under a wonderfully illuminated mackerel sky. Much of the snow had melted the previous day and now the resulting roadside puddles were frozen over with a thick layer of ice. The asphalt roads and paths, however, were dry and offered good traction. I was already close to being late for work but I stopped to make my annual frost angel. And that was all the three speed rides I manged for the week. On Wednesday and Thursday I rode speedier bikes because I was on a tighter schedule. On Friday I rode my winter bike as another snowstorm rolled in, dumping a much greater amount snow, causing traffic havoc as cars slid and spun out on the slushy, icy roads. I chose my route carefully and avoided interacting with the city-wide bumper car madness. It didn’t take long for me to convince myself to buy the wheel to use for a future project. I’m thinking I’ll use it to build another winter bike. When temperatures drop below -20°C an old three speed hub keeps working perfectly while freewheels and freehubs sometimes freeze up. And of course, the enclosed drum brake is perfect for nasty winter riding conditions. The first week of the Three Speed October Challenge has wrapped up and I’ve done some respectable three-speedin’. On each day of the week I managed at least one trip on an appropriate bike. Not all met the requirements of the challenge but I will present them here anyway because in accordance with Rule#3 of The Society of Three Speeds I did indeed ride my “my three speed bicycle with pride and immense enjoyment.”. The main bike this week was my 70’s era Raleigh Superbe. I do so love this one – for me it represents a perfect realization of one type of bicycle design. It’s no lightweight, coming in at about 45 pounds, but it has a wonderfully smooth ride and strikes that elusive balance between responsiveness and stability that is so valuable in a practical machine intended for transportation and recreation. This bike came to me in nearly factory-new condition, with pristine bronze-green paint and all thoughtfully specified components in fine working order, including the hub-dynamo driven front and rear lights. The only additions I’ve made to the bike are new tubes and tires (having replaced the cracked originals with some spiffy new Rubenas) ; a Brooks B67s saddle; Kool Stop Continental brake pads for a bit of assistance with the steel rims; an old double-legged kickstand; and a cheap alloy bell (soon to be replaced with a nice brass Crane). Riding this bike is a true delight and makes this October Challenge no challenge at all, really. Sunday’s ride was an easy 10km round trip to pick up my son. Towing the trailer with the Superbe was a snap, although with the lesser braking effectiveness of the steel rims I wouldn’t want to do this in the rain. I don’t know how many more trips there will be with the trailer anyway, as by springtime I expect I would have to fold the boy over twice to fit him in there.It’ll be the end of an era. Monday’s ride was a 20km round trip commute to work on the Superbe. I didn’t have much time to dawdle and took no photos. Tuesday’s ride was another 20km round trip to work on the Superbe. 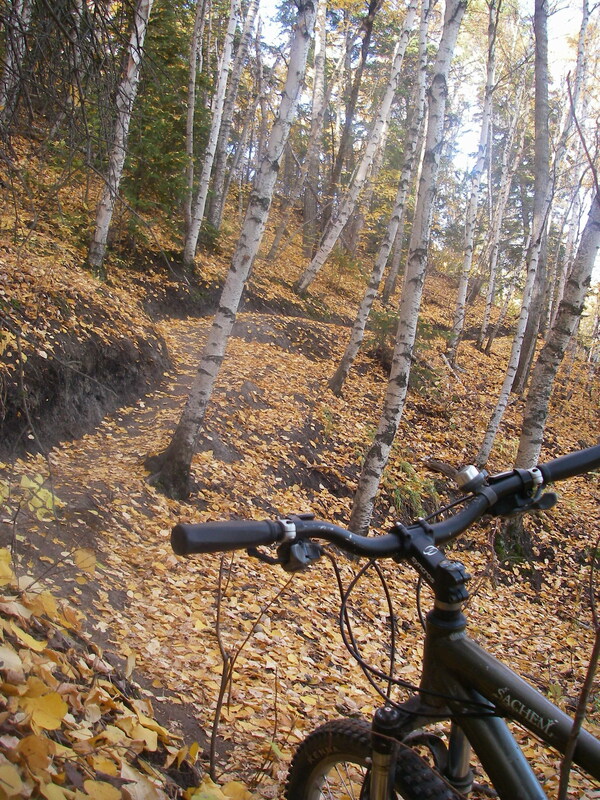 I zipped in briskly on the morning trip but took my time on the return and allowed myself the pleasure of riding some of the gravel trails and sampled the fading autumn splendour of our urban forest. My ride took me over and under bridges and I stopped to take several pictures. I stopped to look at the construction progress where the City will be demolishing the old pedestrian bridge and replacing it with a fancy new one that will accommodate both pedestrians and the trains for the new LRT line. While I support the new public transit project, I will very much miss the old bridge which offered a peaceful place to linger as one crossed the river. The new bridge, while much more visually striking, will offer, at best, a practical way to get across the river. I don’t see it being the pleasant social hub that the old one was. On this day, the area was a proper hive of activity, with a stream of trucks delivering the boulders being used to construct the berm that is required for tearing down the old bridge. On the way up the hill from the construction sight I stopped in at the Chinese Garden. I hadn’t been there in quite a while and was pleasantly surprised to see new carvings of the Chinese zodiac installed. These look quite tamper proof and should last longer than the previous ones that suffered badly at the hands of vandals. Behind these statues you can see the little bridge over the water-less pond. I don’t know if the City ever intends to fill that pond but the bridge will remain a somewhat pointless object to me if they let it remain dry. This day was another 20km round trip commute on my Superbe. Once again, I was racing the clock in the morning but had time to enjoy the ride on the way home. This summer brought more rain than I remember experiencing since I’ve been in Edmonton. It seemed like there was a least a shower per day and many heavy downpours. 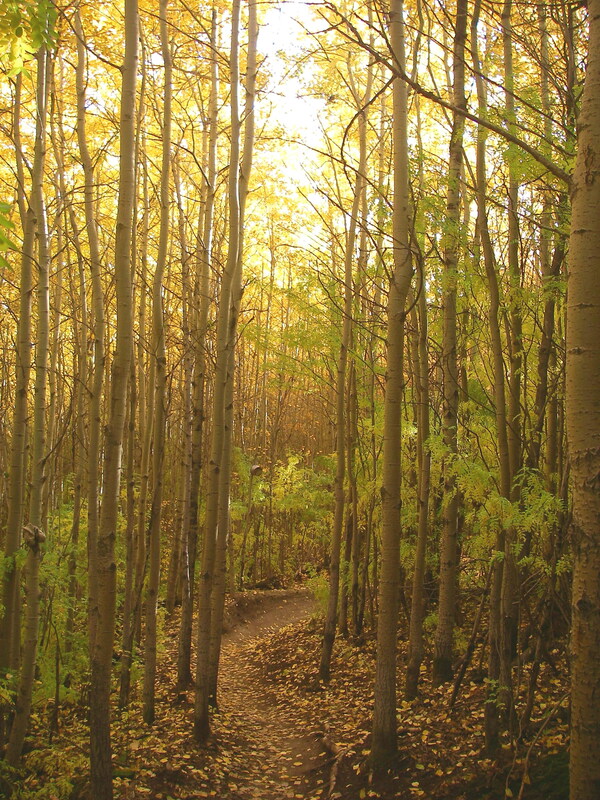 The greenery in my garden thrived, but the trails in the river valley and ravines experienced accelerated erosion and many trails have been closed. The Superbe offered a civilized and refined ride over some mild singletrack and I was reminded how little difference there is between the common old standard of 26 X 1 3/8 wheels (650A) and the new bike-industry darling of 650B. On Thursday I was on a very tight schedule and didn’t commute on a three-speed, opting instead to ride a faster bike. In the evening I did ride the Superbe to my weekly volunteer shift at Bikeworks. I’m not actually sure of the distance for this trip, but as a round trip it likely exceeds the three mile requirement of the challenge. I didn’t take any pictures but on my return home after dark I was able to enjoy the warm (if feeble) glow of the original headlamp and bulb on the bike. Friday’s ride was another 20km round trip commute but this time on my 70s Raleigh 20 Three-Speed folding bike. This bike has appeared in the blog before but I will comment that it is a rugged, fun little bike that moves fast, maneuvers well and is a surprisingly good choice for hauling cargo. I’ve laced new alloy CR18 rims onto the original hubs making it speedier and also enhancing the effectiveness of the brakes. In gesture of cultural solidarity I’ve installed a lovely old French Ideale saddle on this utilitarian British bike (actually it’s there because it looks good and is comfy to sit on). On the morning ride to work it was quite chilly at -5°C and there was a heavy frost on the ground. I resisted the urge to stop and make a frost angel in the grass. Lately my commute has been plagued with routes closed due to construction and nonsensical detour suggestions on the part of the city. At one point I carried my bike up a short flight of stairs instead of taking the ludicrously long official detour and observed from the tracks in the frost that I wasn’t the first person to make that choice. On the way home I stopped for a scenic bike picture against the background of the river valley. The view from my window Saturday morning showed fine Christmas weather outside which is unfortunate because it’s actually the Thanksgiving weekend here in Canada. I spent a good portion of my day sipping piping hot tea and playing guitar but eventually I did stir outside and rode my Superbe to Bikeworks. While there I cut some spokes to length and used the spoke threader to roll new threads on them. These are for the new wheel I’m building for my winter bike and I felt perhaps I had delayed this project too late. A massive group ride had been planned for that evening (one to two hundred riders expected) but it was cancelled due to the weather. That was sad and disrupted my plan of bringing out my third three-speed bike to end the first week of the challenge with a flourish. Thanks for reading (or skipping ahead) to end of this week of challenge. Next weeks riding will include at least some snowy riding and hopefully one more three-speed bike. Here I am, recently awakened from blog cryosleep by Shawn Granton to participate in this year’s Three Speed October challenge from The Society of Three Speeds. There was a challenge last year as well, and I even did a ride for it, took lots of pictures and then failed to document it via the blog. I will be more diligent this year. This year’s challenge requires riding a three speed bike three times a week, for three calendar weeks, with trips of at least three miles. And since I have three of these sorts of bikes I’ll add another personal criteria to the challenge: I’ll ride each of the three bikes at least three times each. That’s a lot of threes, friends. The riding has already begun. 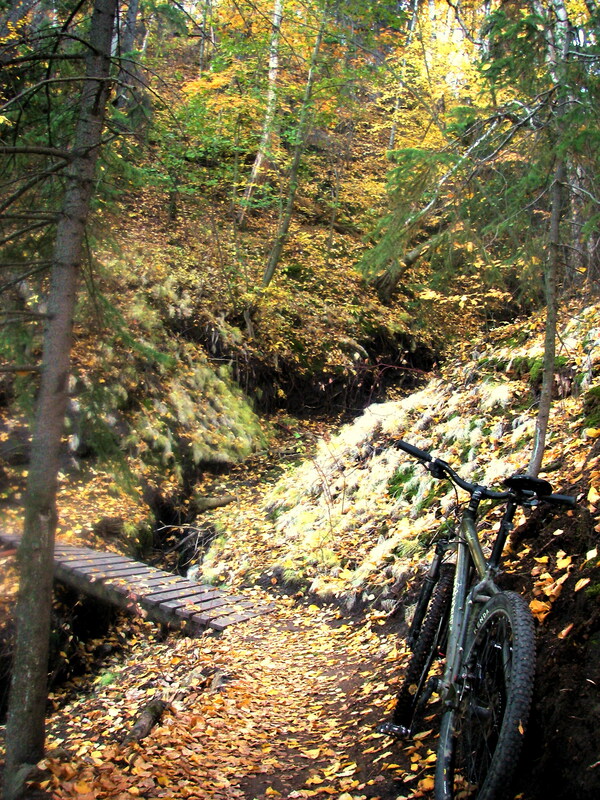 Every Autumn, there is always one perfect trail ride. This was it. The river valley was in full seasonal splendor, the weather was perfect and the paths were gloriously illuminated by the morning sun through the golden leaves. As an added bonus I even rode the trails far better than I usually do, managing ride the Cambodia / Pipedream route eastbound mostly without having to walk the bike. On days like this, I almost think that if I’d started seriously mountain biking a couple of decades earlier I might be skilled by now.